It’s unfortunate that none of NVIDIA’s North American partners will be selling cards based on NVIDIA’s reference design, since NVIDIA is once again using GTX Titan as their template for their design, making for a very high quality card. At the same time it’s unfortunate the reference design will not be available because it means that not everything we have to say about GTX 770 will be applicable to retail cards. We’re essentially reviewing a card with a unique cooler you can’t buy, which has been something of a recurring problem for us with these virtual launches. In lieu of the reference design, NVIDIA’s partners will be going semi-custom right from the start. A lot of what we’re going to see are various 2 and 3 fan open air coolers, however at least a couple of partners will also be selling blowers, albeit plastic in place of the Titan-derived metal cooler. Still, blowers may be a bit hard to come by with GTX 670, which is something of an odd outcome given how prevalent blowers have been at this performance tier in the past. In any case, we have a few different semi-custom GTX 770 cards that just arrived in-house (all of the overclocked variety) which we’ll be looking at next week. 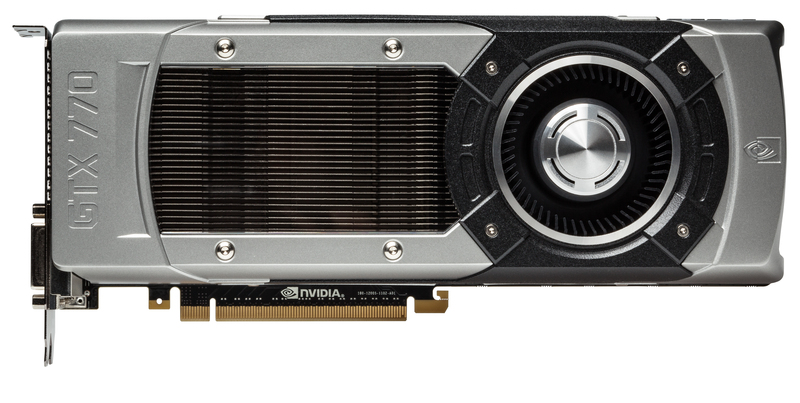 In the meantime let’s dive in to NVIDIA’s reference GTX 770. Whereas GTX 780 was truly a Titan Mini, GTX 770 has a few more accommodations to account for the differences between the products, but the end product is still remarkably Titan-like. In short, GTX 770 is still a 10.5” long card composed of a cast aluminum housing, a nickel-tipped heatsink, an aluminum baseplate, and a vapor chamber providing heat transfer between the GPU and the heatsink. The end result is that NVIDIA maintains Titan’s excellent cooling performance while also maintaining Titan’s solid feel and eye-catching design. The story is much the same on the PCB and component selection. The PCB itself is Titan’s PCB retrofitted for use with GK104 instead of GK110, which amounts to a handful of differences. Besides a new memory layout suitable for a 256bit bus operating at 7GHz, the other big change here is that NVIDIA has scaled down the power circuitry slightly, from a 6+2 phase design for their GK110 cards to a 5+1 phase design for GTX 770, in reflection of GTX 770’s lower 230W TDP. On that note, for those of you looking for clean pictures of the PCB and GPU, unfortunately you will be out of luck as NVIDIA used the same silk-screened Shin-Etsu thermal compound as they did for GTX Titan. This compound is great for transferring heat and a great thing for GTX 770 buyers, but its composition and application means that we can’t take apart these cards without irrevocably damaging their cooling capabilities, and at the same time NVIDIA didn’t take pictures of their own. Anyhow, with all of the similarities between GTX 770 and GTX 780/Titan, we are otherwise looking at a card that could be mistaken for Titan if not for the “GTX 770” stamped into the card’s shroud. This means that the I/O options are also identical, with a set of 8pin + 6pin power sockets providing the necessary extra power, a pair of SLI connectors allowing for up to 3-way SLI, and the NVIDIA standard display output configuration of 2x DL-DVI, 1x HDMI, 1x DisplayPort 1.2. Like GTX 780, we expect to see some interesting designs come out of NVIDIA’s partners. The Titan cooler sets an extremely high bar here given the fact that it was designed for a higher 250W TDP, meaning it’s slightly overpowered for GTX 770. Meanwhile NVIDIA’s Greenlight approval program means that their partners semi-custom and custom designs need to maintain roughly the same level of quality, hence the common use of open-air coolers. Moving on to overclocking, as this is a GPU Boost 2.0 part, overclocking will also operate in the same way it did on GTX 780, and yes, this includes overvolting. GTX 770’s maximum power target is 106% (244W), and a very mild overvoltage of +0.012v is available, unlocking one higher boost bin. This also means that GTX 770 follows the usual TDP and temperature throttling conditions, with a standard temperature throttle of 80C. In practice (at least on our reference card) GTX 770 typically reaches its highest clockspeeds before it reaches the TDP or temperature throttles, so these are mostly of use in concert with overvolting and the use of offset clocks. 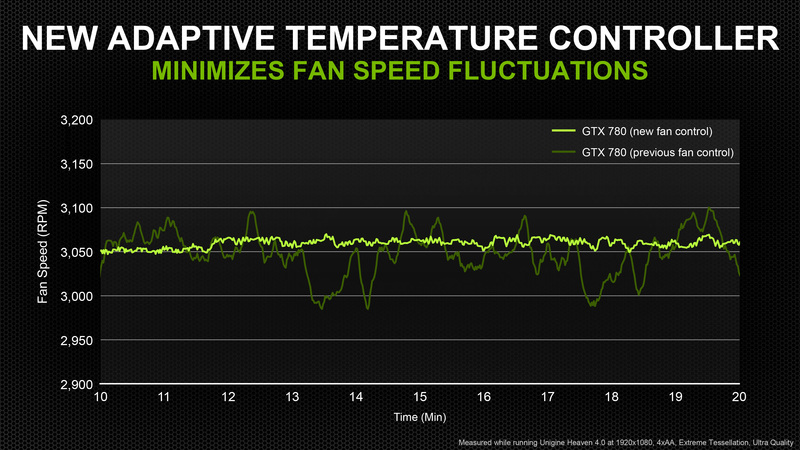 Finally, GTX 770 also includes the incremental fan speed improvements first introduced last week with GTX 780. 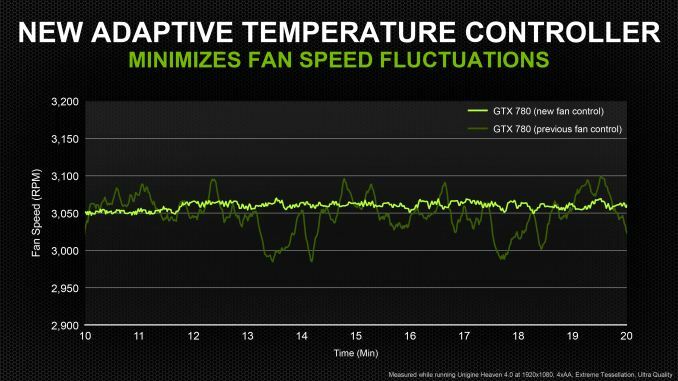 So like GTX 780, GTX 770’s default fan controller programming is biased to react more slowly to temperature changes in order to minimize sudden shifts in fan speed. what matters is how many FPS you get per dollar. who cares about getting flagships when you reach 60fps ? and how many people pay 4000$ for high end gaming machine ?